MY MILK TOOF: Happy New Year! This book has been such a labor of love over the past year, and I can hardly wait to finally share it with you in a couple months. As the release date gets closer, I'll make sure to post more information about the book and the process of making it. Thank you again for all your support and wonderful comments. Wishing all of you a truly wonderful new year from me, ickle, & Lardee! That's so exciting! Can't wait to hear more about the book. The cover certainly is adorable. I can only imagine how great it will be. That's awesome! Happy New Year Inhae, ickle & Lardee! Happy New Year lovely Toofies!!! Congratulations!! So exciting! Wishing you a happy, healthy, and prosperous New Year! Happy New Year ickle and Lardee ! congratulations! i'm so inspired with your work. loving your posts everyday :)have a happy new year. Happy new year indeed! I am so excited for you. And I sincerely cannot wait to see more of Ickle and Lardee. How exciting! Can't wait. Happy New Year! congrats and HAPPY NEW YEAR!!!! It looks fantastic...happy new year! I can't wait to order it as well! Can't wait for this book! I'm sure it will make an awesome present! Congratulations Inhae! You deserve this success and I am sure that this book will surprise us! I wish you a 2011 full of creativity! Wow, how wonderful! Congratulations! You must be so very excited. :) I know we certainly are! great news! J'espère tenir entre mes mains cet album! I cannot wait to purchase the book!!!! Happy New Year to all! I hope the new year brings lots of toys and snacks to ickle and Lardee. It must be very cute one and nice..
Can't wait 'til the book is published! in march, perfect! hopefully I can get a copy of the book for my birthday! Happy New year!! I'm looking forward to the book!!! Happy New Year to you and we are really looking forward to your book release. I can't wait till it comes out! definitely a must buy! Happy New Year 2 u 2!!!! I can't wait to read it! The book will be released in Brazil too? do you want free blog promotion? take a look at the tab 'blog promotion'! Woh, exciting :D Im so happy for you! Listed you on "Stylish Blogger Award" enter my blog to see how it works! 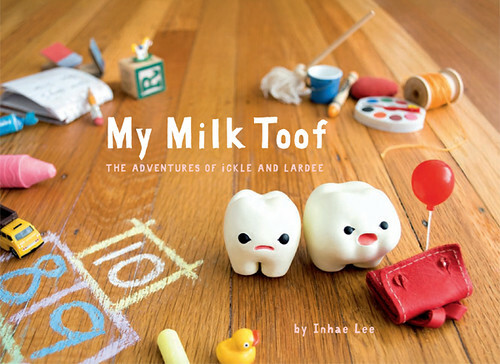 I want to get this book for my son's 10th b-day in March :) He adores both Ickle and Lardee! I just want to know that will this open for oversea buyer? Since I've already missed your first publish ^^"
I want one! SO, I am hoping that you will be shipping to australia! PS- I have been sharing your blog with everyone at work and it is much loved. We just wish that ickle and Lardee would have an adventure everyday! Can't wait to have that book in my hands ! It will be a wonderful moment. Congratulations! I would like one. Do you ship into Hungary? Congratulatios for your milk toof , it´s adorable! You're so very inspiring Inhae! Heartiest congratulations and a wonderful new year. Yay! Can't wait to see it. Congrats to you three :) I'm sure your book is going to do really well! Can't wait to buy it!!! i think i shoud write in here.. just to, first, wish you lucky on this stage, i realy hope u can make it! second, to tell u im from sao paulo, brazil and ur stories are without equal and FUNtastcally poduced! PS. please, post, post, post! Congratuations !! A book ! Its awesome =) and happy new year ! Congrats on the new book! I just came across your blog and I have to say I love it!! It's too cute. didn't you had the project to make a book with a fench publisher? I'm sure I've been reading someday somewhere on your blog something like that! And congratulations on the new book!!! I just pre-ordered it on amazon! Can't wait to have it in my hands! can't wait to hold the book in my hand.. haha.. Happy new year! Good luck and congratulations on your upcoming book. Can't wait either! Please ship internationally! I just discovered your Tooth, I think I'm in love !!! Hope your book will be available in France, I do want it ! Thanks for your job, that's really great (more than my english, no doubt !). Looking forward to the release, and curious about how you will be publishing it. got my copy of the book today. I buy the book in February, but only now this arrived ( i live in brazil ). I Love the book! So beautiful! You does one excellent job! I'll make sure that you post more information about the book.